Herman Cain is being questioned about reports that during the 1990s he sexually harassed several women and his employer paid them hush money. The Right, who (re)discovered white victimology and grievance politics with the election of President Obama, and racism with their embrace of Herman Cain, have now deployed the "high tech lynching" oeuvre. Clarence Thomas introduced that ugly phrase into the popular imagination with his pleading, desperate defense against sexual harassment charges during the Anita Hill scandal. Since that moment, it has become a type of lengua franca for black conservatives and their defenders. Ann Coulter has used that ugly language to defend Herman Cain. Rush Limbaugh has used that ugly language to defend Herman Cain. 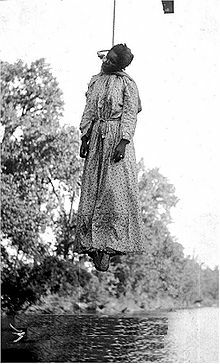 Herman Cain himself has feigned martyrdom and invited a high tech lynching as proof of his bonafides as a black conservative. The history of African Americans is a plaything for the Right and black conservatives. They pretend that Dr. King would have supported them, that the Democratic Party is a plantation, and black people are zombies and brainwashed fools--as opposed to a radically democratic and revolutionary people whose struggles have forced American democracy to live up to its potential and creed. 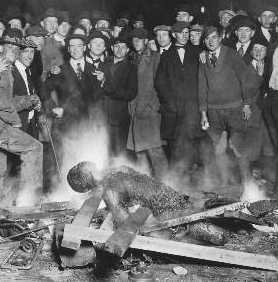 Thus, the use of the phrase high tech lynching by conservatives, and their black lapdogs, is in no way a surprise. A lack of surprise at their abuse of language, and distortion of history, is not a defense; nor is it an excuse. Herman Cain is not being lynched--be it by "high tech" or "low tech" means. 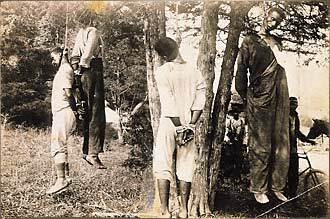 Black conservatives are not being lynched--be it by "liberals" or other black folks. If conservatives are willing to evoke the ancestors, and a very dark, twisted, and troubling history to make a cheap political point, they ought to be willing to look into the face of the very legacy and reality they reference. To point: the political action committee Americans for Herman Cain has circulated an email provocatively titled "Don’t let the left ‘lynch’ another black conservative." This letter is intended to rally the troops in a spirited defense of their chosen son against an evil mob that would do him harm, hanging him from the lynching tree, where he would dangle like so much strange fruit. 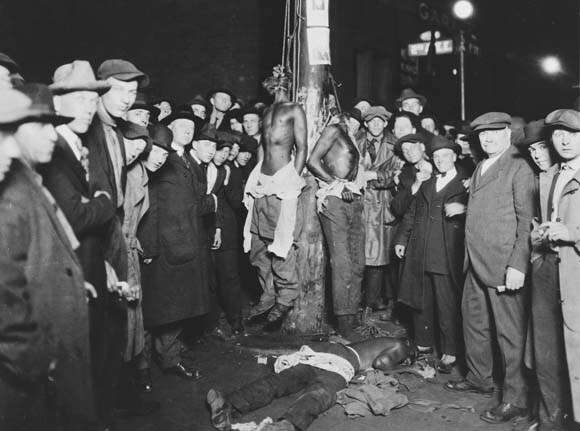 As an experiment and object lesson, I am going to mate Herman Cain and his ally's pleas for money with some actual images from America's century-long history of lynching. Perhaps this simple act will expose the ugliness, cowardice, and disrespect that Black Conservatives and others have for the history of African Americans (and our struggle for full freedom and equality across the Black Atlantic), when they play with the language of racialized violence and slavery. Folks often forget that words are violence. When Herman Cain and his allies utter the phrase "high tech lynching" they are committing a violent act. The tragedy for Herman Cain is that his allusions to lynching are a type of self-inflicted wound against the black community, a group to which he has some ostensible attachment. I am troubled by that fact; However, I am more disturbed that Herman Cain, a child of the South, and Jim and Jane Crow, may not understand the harm that he does to himself, and to others, when he cries that he is a victim of human barbarism, most gross and most cruel. I have a request. Herman Cain, please get the phrase "high tech lynching" out of your mouth. Please, tell your alllies to do the same. 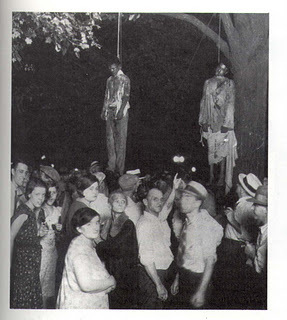 You are not being lynched. Nor, are you under any such existential threat. They’re at it again. The left is trying to destroy Herman Cain - just like they did to Clarence Thomas. They are engaging in a “high tech” lynching by smearing his reputation and attacking his character. The idea of a black conservative like Herman Cain as the GOP nominee is Barack Obama and the Left’s worst nightmare. That’s why they will do anything to take him down. As the leading pro-Cain committee, we intend to fight back by launching one million phone calls in Iowa to defend Herman Cain. Will you join us? The left wing have told Conservatives they have to pick Mitt Romney, despite his flip-flops on abortion, immigration, gun control. They’ve told us he’s more electable, ignoring the fact he’s lagging behind in the polls after 6 years of campaigning. Let’s send a clear message to those who would like to tell us what to do. Let’s stand up against those who would like to take down any black man who stands up for Conservative values. Join “Americans for Herman Cain” today and support our efforts to fight back. We have a real choice this time: Herman Cain. Will you help him today? It’s days like this that reminds us why we launched “Americans for Herman Cain,” a project of 9-9-9 Fund. Herman Cain has grassroots support. He has the poll numbers. He is a conservative. He can beat Barack Obama. Now it’s our job to propel him to victory in Iowa, New Hampshire, Nevada, South Carolina, Florida, Michigan, and Arizona. Will you help us by helping fund part of the one million phone calls we are starting ASAP in Iowa? Will you help us elect a true conservative outsider in the mold of Ronald Reagan to the White House? Well said. It's obscene to compare ordinary bad press for a politician with those horrors. There you go again, with your history 'n' all. I agree, if they are going to use that terminology in defense of Cain, they should also be willing to add the images that place their claims in perspective. Of course that will not occur to them because there is no real concern for the treatment of blacks. Conservative or otherwise. They'd really rather not discuss it beyond soundbites and would chose to ignore all that they couldn't use. Another one of those cringe-inducing, geez I hope that guy (Jordan Gehrke) isn't white moments. But of course to ask the rhetorical question is to answer it. The pictures say it all. Well I could not have predicted Cain's rise two years ago, but I did predict that the wing nuts would reach new depths of depravity. I caught some of the vid out there of Coulter. 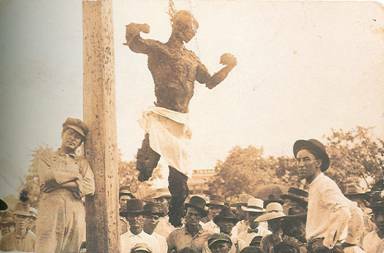 Even more disgusting was Brent Bozel trying to defend the lynching meme. And then there's (of all the disgusting pieces of alleged humanity) Donald Trump accusing Jon Stewart of racism, on account of tone of voice??? Thought occured to me that these people are always playing some weird game that only they know rules for, and only they seem to like. Race is just the wierdest part of it. Oh. And I really try not to even listen to snippets of Rush Limbaugh, but I will read media reports of his spewage. And speaking of weird games, the other day he all but admitted to playing the race card just for the thrill of hurling it at dems and libs. Like I said, it's a weird game only they seem to get. But it is clear. They are enjoying it. It's like they feel they have historically deprived of some thing, and finally feel they are able to get it. Never mind the baselessness of the circumstances. @ abstentus, I agree. It's surreal. Like some twisted game of Bingo where there is a board of talking points and every letter is place in the draw pot. The names that are spelled out first is who gets to be the most disgusting person of the week, for prizes.